Unsuspecting hungover rival spotted on a sun lounger. 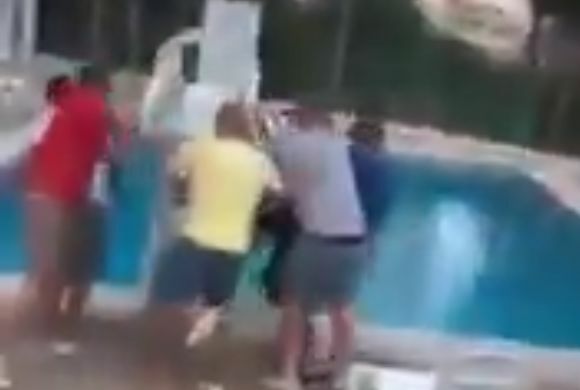 Watch five unruly Middlesbrough fans, said to be on holiday, creep up on an unsuspecting Newcastle supporter and throw him in the pool he was lounging beside, apparently snoozing off a hangover. The sniggering group team up to tip the seemingly oblivious Newcastle fan’s sun lounger over and run off laughing as the man crashes into the water face first. I presumed he could swim or did he just drown?